Check Indian Army Short service commission (SSC) Recruitment Details: The Armed forces medical services recruitment 2019 had been issued now to recruit the dynamic aspirants who have a desire to work in the Indian army. All such talented aspirants who have a severe intention to serve country must apply this AMC SSC Notification 2019 before going the last date. Interested and eligible job seekers can have the look at these short service commission army vacancies available at the official web portal which is amcsscentry.gov.in. The online application for the Armed Forces Medical Services SSC Recruitment 2019 now started hence jobless candidates must register their name all the way through www.amcsscentry.gov.in. The last date to apply online for AMC SSC Online Application 2019 is going to be updated shortly, who want to know the education qualification, age limit, application fee and other details relating to this notice read out the below-mentioned article in order to get an idea of this employment www.amcsscentry.gov.in notification. The interested job seeker must possess a medical qualification included in First/Second Schedule or Part II of the Third Schedule of IMC Act 1956. Or applicants must have permanent registration from any State Medical Council/MCI. The most important thing is aspirants must have Post graduate degree/diploma holders i.e. MD/MS/MCH/DM/DNB/DLO/DOMS/DA may also apply. Only those aspirants may apply online who have completed/completing their internship on or before March. Applicants should have maximum age 45 years. Aspirants will be shortlisted based on their performance in the interview conducted by a Board of Officers to assess candidate suitability and merit for grant of Short Service Commission in the Armed Forces Medical Services. Enter all the required fields. Save a copy for further reference. Candidates must aware that they can apply Online Indian Army SSC Officer Vacancy 2019 or fill Online Application Form on or before the last date which was updated by the department soon. 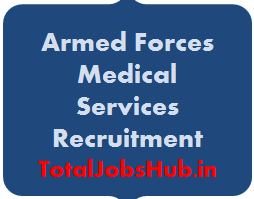 On this web section of totaljobshub.in trying to provide all the details regarding Army Medical Corps (AMC) if you have still any query related to this vacancy notification of Indian Army please let us know by leaving your precious comment at the end of the comment box. Dear candidate’s applications are invited only for the Indian citizens both male and female, who have completed or passed the final MBBS examination in the first or second attempt and completed the internship, for the Positions of SSC in the Armed Forces Medical Services.